If you read my Finding the Perfect Planner post you know I have been on the look out for a new agenda to try out. I like the Lilly Pulitzer agenda but its not perfect. 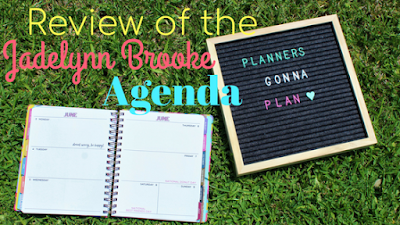 Jadelynn Brooke released three planners in their 3 Happy Hooligans line and I thought I would get one to see if I like it any better than the planner I've been using. There are three cover styles to choose from. I chose the Big Confetti cover because I like to add stickers to my planner covers and a simple cover is great for that. The 17 month planner is 7"x 9", has a rose gold elastic band to hold the book closed, a rose gold spiral, and fun metallic foil is used throughout the book. The agenda includes all major holidays and a few other fun ones. In the front of the planner there are a few fun extras including a 2019 calendar, two sticker sheets, a bucket list, and more. Each month has a fun cover related to a holiday or the season that occurs during that month. February has to be one of my favorites because it has a place to put a picture of you and "your person." The back of the planner has a place for writing notes which is where I typically write my school passwords so I have easy access to all of them while at school. The monthly calendars are pretty simple with little pops of color. There are fun national holidays added to each month such as National Best Friends Day in June. The weekly spreads are also pretty simple which I originally didn't think I would like because I usually use a Lilly planner which has color and pattern everywhere but I like this because I can add my own touches to each week by using stickers, washi tape, and fun pens. Each week also has an inspirational quote and national holidays.